The Monarchs are a rather large Old World family of (mostly) arboreal flycatchers. Like the New World flycatchers (Tyrannidae) and the Old World flycatchers (Muscicapidae), many of them forage for flying insects by sallying out from perches, and many build cup-like nests. Many have previously been called "flycatchers," but the modern trend is to call them "monarchs," as they are not related to the other "flycatcher" families. The Monarchs reach their greatest diversity in the Old World tropics on islands between Asia and Australia. Some very dramatic birds occur in the Philippines, Indonesia, and New Guinea. One is Rufous-collared Monarch (left, on a nest in a fine photo by Steve Wilson). It is one of the monarchs to show colorful bare wattles around the eye. Although monarchs are not large in size, some of their plumage features are very impressive. Celestial Monarch (below left, in an amazing shot by Mark Sutton), in the lowlands of a couple Philippine islands, has a electric sky-blue crest,. White-naped Monarch (below right), endemic to the northern Moluccas, is black-and-white with amazing facial tufts. Many of these wonderful birds are in decline; some are endangered. Celestial Monarch has been recently found at only 10 sites in its severely fragmented lowland habitat (Birdlife International 2000). During my first visit to the Philippines in 1990, no one knew where or how to find Celestial Monarch. It was a mythical bird. By 2005, though, the late Tim Fisher and his cadre of local guides knew how to find it: one must know and listen for its call and then track it down in the canopy. This can be exceedingly difficult to do. We spent many hours in the muggy lowland forest searching for this bird. When it was found, not all of our group got on it. It just disappears high in the canopy. But those of us who did see it learned, as shown in Sutton's photo, that the crest lies flat atop the head. It is listed as Endangered. 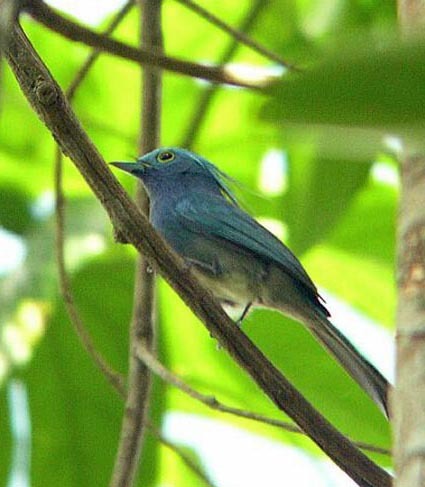 Among endangered monarchs, Cerulean Paradise-Flycatcher Eutrichomyias rowleyi, restricted to the island of Sangihe, Indonesia, was considered extinct by Clements (1991), but was rediscovered during surveys in 1998 (but just 21 birds at six sites; Birdlife International 2000). Many endemic monarchs to small Wallacean islands have also been rediscovered this past decade, and for some populations are better than had been feared. Others remain problematic. Some 15 species of monarchs from Pacific Ocean islands are listed as seriously threatened with extinction (Birdlife International 2000). Those in the "critical" category include Tahiti Monarch Pomarea nigra (just 9 pairs and 24 birds remaining as of Jan 2000), and Fatuhiva Monarch P. whitneyi (endemic to Fatu Hiva in the Marquesas in density of only 1 pair/10 ha). Taxonomy is also a problem and has been in flux for some time. Take Spectacled Monarch for example. There is a complex of populations from Halmahera and the Lesser Sundas to eastern Australia. As explained by Rheindt & Hutchinson (2007), those population that have lost rufous coloration to the breast and neck have been elevated to species status — such as Black-chinned Monarch S. boanensis and Black-tipped Monarch S. loricatus — leaving between "a swiss cheese" complex of rufous-breasted monarchs from Indonesia to Australia, all called Spectacled Monarch S. trivirgatus, even though Black-chinned Monarch is considered a "good" species that exists on a tiny island just a few miles of Seram, which has a rufous-breasted bird. Clearly a thorough review and revision is necessary. As it currently stands, some world checklists (such as IOC) split the Halmahera bird (shown above) as "Moluccan Monarch S. bimaculatus" This may be proper but it is very piecemeal, since the entire complex needs revision. ["Moluccan Monarch" is also a poor English name, since other Moluccan populations likely are of species-level status; see Rheindt & Hutchinson (2007) on the Seram population.] Filardi & Moyle (2005) showed that the genus Monarcha was paraphyletic and had to be split into at least 3 genera; Symposiachrus was resurrected for Spectacled Monarch and close relatives. Then Filardi & Smith (2005) focused in on the Symposiachrus monarchs, and found that Spectacled Monarch was paraphyletic as a species, since the resident populations on Cape York, Australia, were more closely related to Spot-winged Monarch S. guttula of New Guinea than they were to migrant population of Spectacled Monarch elsewhere in eastern Australia (S. t. gouldi). A lot more work is needed. Beyond the intriguing monarchs of the Pacific tropics, though, the family Monarchidae has other fabulous birds. Among the loveliest are 15 paradise-flycatchers in two genera. Most are in the genus Terpsiphone, like this Red-bellied Paradise-Flycatcher (left). 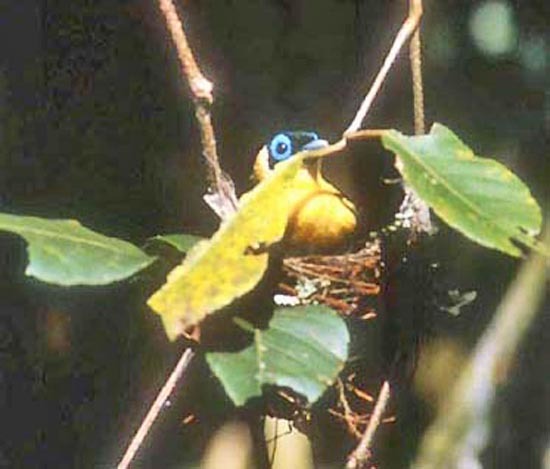 The species frequents the dense forest of the Congo Basin and west Africa; here it is on a nest then under construction in Uganda. 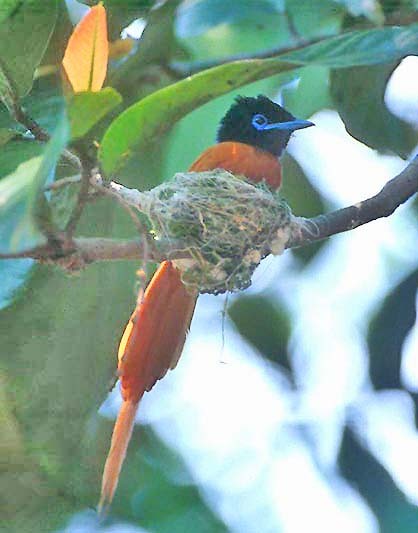 Other species are migratory, such as the Asian Paradise-Flycatcher T. paradisi. Its annual arrival at Bharatpur in north-central India heralds the beginning of spring there, just as American Robins do in the eastern United States. There are some species of paradise-flycatcher that have dramatic sexual dimorphism. A good example is the Seychelles Paradise-Flycatcher (below), a rare and threatened species currently restricted to a single island (La Digue) in the Seychelles. 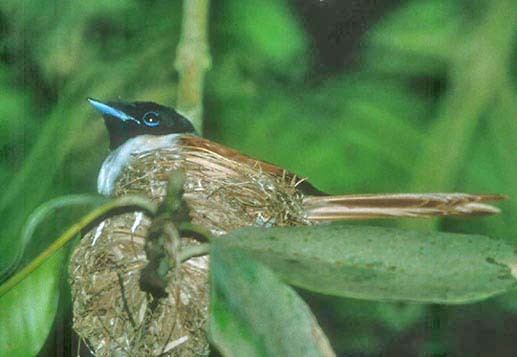 The female (shown here on a nest) is tricolored in black, rust, and white; she has only a medium length tail for a paradise-flycatcher. The all-black male, however, has an exceptionally long tail that drags behind, undulating in flight. Paradise-Flycatchers are known for their beautiful long tails in adult males. Madagascar Paradise-Flycatcher (right, in a nice shot by Murray Lord). Not all species of paradise-flycatchers have that trait. The Mascarene Paradise-Flycatcher (below), for example, has rather medium length tails in both sexes. This photo is of a female; she, like almost all members of the Monarchidae, has a rather shallow, broad bill. Monarchs are often characterized by broad, flattened bills with a slightly hooked tip, a subterminal maxillary notch, rictal bristles and rounded nostrils (Sibley 1996). Africa may the center of the paradise-flycatcher world, with 7 of 15 species, but I find it particularly interesting that ancestral flycatchers made it to offshore islands in the Indian Ocean and evolved into separate species on Madagascar [Terpsiphone mutata], on Mauritius and Réunion [T. bourbonnensis], on the Seychelles [T. corvina], and on Annobón Island [T. smithii]. There is also a species on Sao Tomé Island in the Gulf of Guinea off west Africa [T. atrochalybeia]. There are also paradise-flycatchers in the western Pacific. 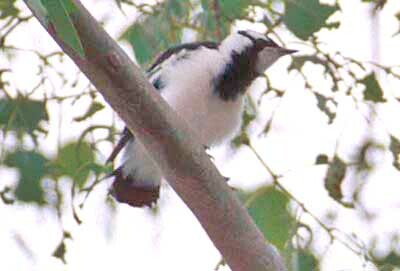 A species in Japan migrates to the Asian mainland in winter [T. atrocaudata], and there are two species on the Philippines. Rufous Paradise-Flycatcher (right, in a lovely photo by Blake Matheson) lives in humid lowland forests. These habitats are rapidly being lost on Mindanao, where this picture was taken. Despite its brilliant color, one primarily finds Rufous Paradise-Flycatcher by voice. The jungles are just that thick and difficult. Sibley & Ahlquist (1990) showed that the monarchs were among those evolved from the great corvid assemblage that arose in Australasia, and certainly the family's center of abundance is there and stretching westward to Wallacea and the Philippines. Filardi & Moyle (2005) showed, though, that the spread of monarchs was not simply "downstream," i.e., from continents to islands. Through molecular evidence they found that some "upstream" colonization occurred in monarchs — members of island populations later colonized continental Australia and diversified. Outside of the 'mainstream' Monarchidae, much of it on islands, and aside from the radiation of paradise-flycatchers in Africa and Asia, rather few monarchs have colonized and survived in mainland Asia. One is the widespread Black-naped Monarch Hypothymis azurea which ranges from India to Borneo and western Indonesia. Recent split from that species is Pale-blue Monarch (left), an endemic in the Sulawesi lowlands. There are also 7 or so monarchs, plus Magpie-lark (see below), that breed in continental Australia. Like many in the family, they build tightly-woven open-cup nests. This Restless Flycatcher (below) is sitting tight on such a nest. A most impressive example of distributional radiation and evolution are the many species of monarchs far-flung across the Pacific. 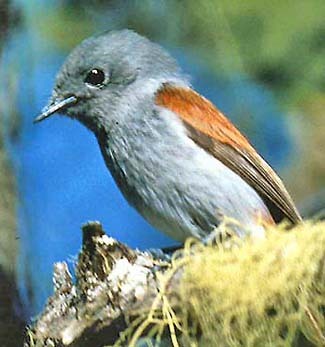 There are shrikebills (Clytorhynchus) on Fiji, New Caledonia, and the Solomons. There are monarchs on many islands in Melanesia and Micronesia. One monarch even reached Hawaii: the 'Elepaio (left), which then evolved subspecific differences on three islands (Kauai, Oahu, Hawaii), including three subspecies on the big island of Hawaii itself (Pratt et al. 1987). The 'Elepaio shown is the race on the Hilo side of Hawaii C. s. ridgwayi, called the "Volcano 'Elepaio". The saddest part of the Pacific island story is that quite a number of species are now threatened with extinction. Although the Myiagra monarchs on some islands are still common, others are losing ground rapidly and at least one is already lost. In 1979 a trip around the world with my father and sister took me to Guam. 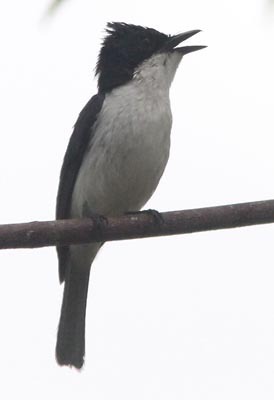 With just one day to go birding, that I saw the Guam Flycatcher Myiagra freycineti (also known as Guam Myiagra or, back then, Guam Boatbill. It was in the remnant forest at the north tip of Guam. That was 29 Aug 1979, and I wrote a brief field description of the bird. It was then thought to be fairly common. A horrendous population crash of all Guam birds, including the monarch, took place in the 1980s, primarily due to the accidental introduction of the Brown Tree Snake Boiga irregularis from New Guinea. There were no native snakes on Guam. This non-native predator, against which birds had evolved no defensive strategies, essentially wiped out the native landbirds of Guam . Some, like the Guam Rail Galliralus owstoni, were saved by capturing remaining rails for captive breeding (I saw a wild Guam Rail the same day as the Guam Monarch, before the population collapses). But the flycatcher was decimated. It was extinct within the decade. Just 30 years ago I saw that lovely little monarch as a wild bird. Today it is extinct, never to be seen again. It is hard to accept things like that. 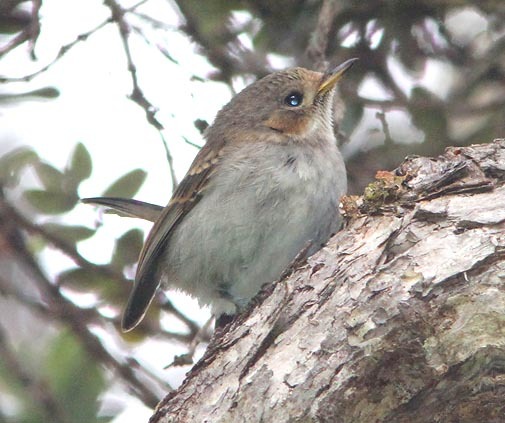 There are still an assortment of Myiagra flycatchers in Australasia and the south Pacific. 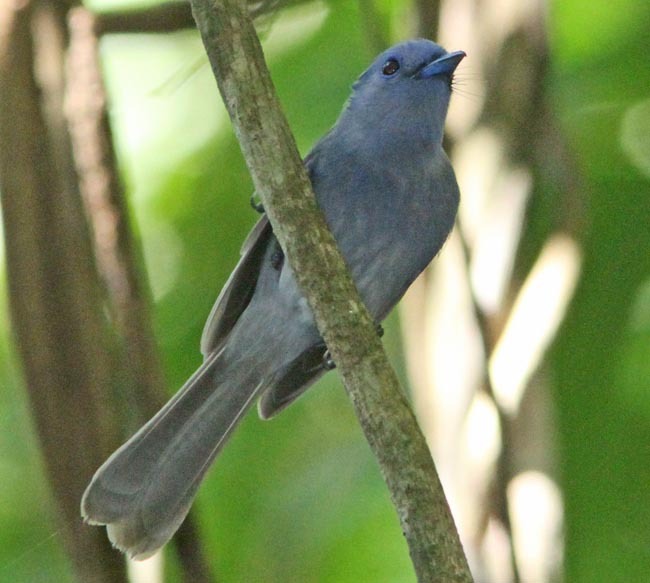 One is Moluccan Flycatcher (or Slaty Myiagra; below), endemic to the Moluccas, and it is dimorphic in plumage. 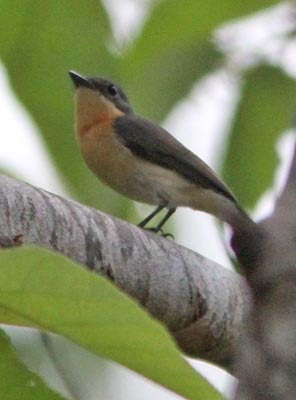 The female (below mddile) has a pattern rather similar to the now-extinct Guam Flycatcher — grayish above with a buffy wash to the breast. 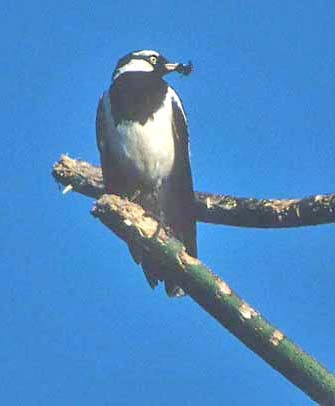 The male Guam Flycatcher was glossy blue-black and also had a buffy wash to breast; male Moluccan (below left) is similar but is white-breasted. 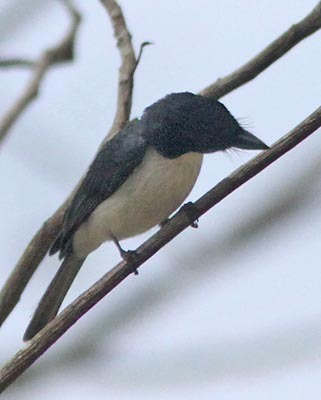 Many of the Myiagra flycatchers have this generalized pattern. On the final photo (below right) we can see the bill shape of the male Moluccan –— and similar to other Myiagra flycatchers — that gave rise to the old name "boatbill" for these little birds. The bill is very wide. On a brighter side, one final set of monarchs appear to be doing fine. 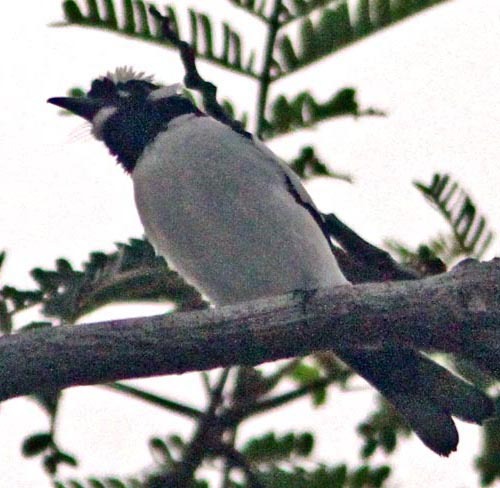 Indeed, Magpie-Lark (left) is common in Australia and southern New Guinea. It, and the Torrent-lark Grallina bruijni in montane New Guinea, have traditionally been considered to be the two members of the family Grallinidae. However, molecular evidence indicates that the two members of the genus Grallina are deeply embedded within the monarch assemblage (Baverstock et al. 1992, Sibley 1996, Schodde & Mason 1999). Unfortunately, the assignments of text and species in the Handbook of Birds of the World series were, of necessity, decided years prior to publication. The initial decision was to treat the Grallinidae as a family. By the time of the publication of the Monarchidae (Coates et al. 2006) it was acknowledged that the "most recent analysis strongly indicates that the magpie-larks are, indeed, monarchs" (p. 247). Yet it was too late to change, and "Grallinidae" has a family chapter in Vol. 14. Schodde & Mason (1999) wrote, as to revising the placement of magpie-larks into the clade with drongos, fantails and monarchs: "Molecular and cranial studies have since shown that magpie-larks are unquestionably dicrurids. This makes sense of their slow buoyant flight, colour pattern and sexual dimorphism which is Monarcha-like; even pallid bill, inner nest structure, egg markings and the Myiagra-like begging calls of its fledglings fit." These words make even better sense when placing them directly in the Monarchidae itself. Indeed, they are so embedded that most recent authors do not even give them subfamily status (e.g., Dickinson 2003). The distinctively patterned Magpie-lark (right) is widespread in Australia (Blakers et al. 1984). It is often one of the first new birds seen on a visit "down under." They walk in pastures and cleared areas wherever water is nearby, including the lawns on the Cairns' esplanade (above left). They also reside in the drier plains of the interior, where this adult was carrying food for nestlings (right). The other species in the genus, Torrent-lark, occurs only in montane New Guinea where it haunts rocky, swift-flowing streams. It forages on exposed rocks in streams, or sometime wet gravel nearby (even on roads; Coates 1990). This sounds like the niche filled by the forktails in southeast Asia. The Magpie-lark builds thick cup-like mud nests; fledged young birds (left) are fed by the parents for a time, and then form erratic flocks. This is the closest to any wandering made by most of these birds, although some seasonal movements have been noted in the Torres Strait region and vagrants do occasionally occur to Tasmania (Blakers et al. 1984). Birds mostly occur in pairs or small family parties. Clements (1991) uses the term "Mudnest Builders" for the Grallinidae but some Australian texts (e.g., Simpson & Day 1996) calls the Corcoracidae (Apostlebirds) the "Australian Mud-Nesters" [species of both groups build mud nests]. They were once considered part of the same family but they are unrelated. The building of mud nests was just a common adaptation to living in open interior country — the same adaptation is made by the horneros in South America. Finally, there are some birds of ancient lineage in the corvoid assemblage that may be basal elements of the Monarch evolutionary tree. The Blue-capped Ifrita Ifrita kowaldi may be an early branch of monarchs, and best assigned to this family. This tentative hypothesis is suggested by molecular studies (e.g., Barker et al. 2004, Norman et al. 2009, Jønsson et al. 2011) but the Ifrita remains an enigma of uncertain relationships. I have separate pages on this mystery bird at the link at its name. 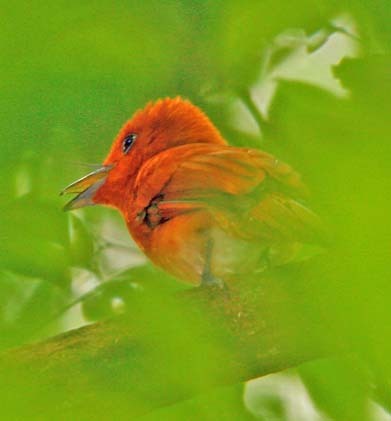 Photos: Steve Wilson photographed the Rufous-collared Monarch Arses insularis at a nest behind the research center at Baiyer River reserve, Papua New Guinea, on 27 Oct 1983 (my photo attempt didn't work on this bird). Mark Sutton photographed the Celestial Monarch Hypothymis coelestis at Apaya, Luzon, Philippines, on 6 Apr 2004. The White-naped Monarch Carterornis pileatus was at Foli, Halmahera, Indonesia, on 7 Oct 2011. The Halmahera race (species?) of the Spectacled Monarch Symposiachrus trivirgatus bimaculatus was at the mountain pass on the Buli Road in Halmahera, Indonesia, in Oct 2011. The Red-bellied (sometimes called Black-headed) Paradise-Flycatcher Terpsiphone rufiventer was photographed at Kibale Forest, Uganda, 26 July 2002. Murray Lord photographed the Madagascar Paradise-Flycatcher Terpsiphone mutata near Ifaty, Madagascar, on 8 October 2005. The Mascarene Paradise-Flycatcher Terpsiphone bourbonnensis was above Le Brulé, Réunion Island, on 4 Dec 1992. The Seychelles Paradise-Flycatcher Terpsiphone corvina was on La Digue I., Seychelles, on 13 Nov 1992. Blake Matheson photographed the Rufous Paradise-Flycatcher Terpsiphone cinnamomea in the PICOP forest, Mindanao, the Philippines, on 28 Dec 2005. The Pale-blue Monarch Hypothymis puella was at Tangkoko NP, Sulawesi, Indonesia, in Oct 2011. 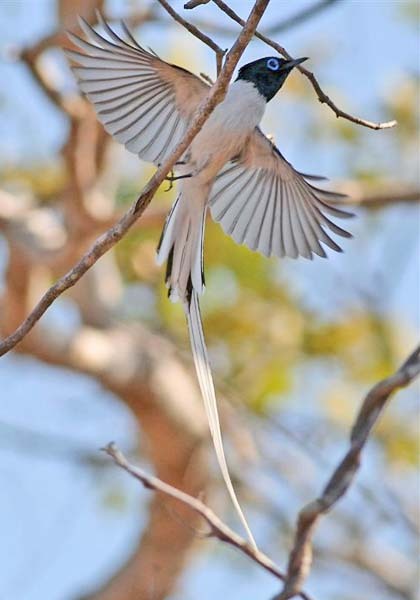 The nesting Restless Flycatcher Myiagra inquieta was in the Hawkesbury Valley, N.S.W., Australia, on 18 Sep 1983. The 'Elepaio Chasiempis sandwichensis was in the Hakalau Forest NWR, Hawaii, Hawaii, on 2 Jan 2012. 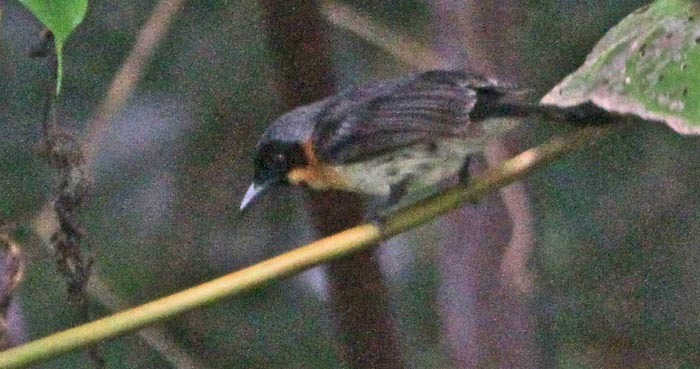 The Moluccan Flycatcher Myiagra galeata was at Foli, Halmahera, Indonesia, on 7 Oct 2011. 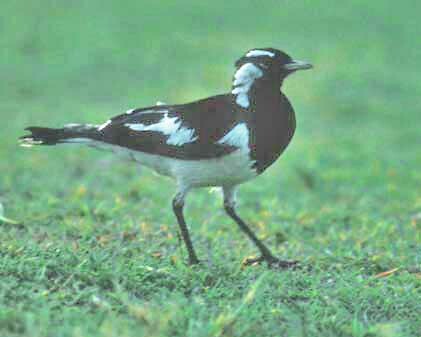 The Magpie-lark Grallina cyanoleuca photos were taken, respectively: at Cairns, Queensland, in Nov 1983; carrying food at Deniliquin, New South Wales, on 1 Jan 1998; and the still dependent fledgling near Mareeba, Queensland, in Jan 1998. Photos © Don Roberson, except Rufous-collared Monarch © Steve Wilson, Celestial Monarch © Mark Sutton, and Rufous Paradise-Flycatcher © Blake Matheson, all used with permission; all rights reserved. Bibliographic note: There is no family book but the Handbook of the Birds of the World chapter (Coates et al. 2006) is a good introduction and has many superb photographs, although it does include various birds that are now known not to be monarchs, and fails to include Magpie-lark and Torrent-lark, which are. Additional great photographs of many New Guinea monarchs are in Coates (1990). Baverstock, P.R., R. Schodde, L. Christidis, M. Krieg, and J. Birrell. 1992. Evolutionary relationships of the Australasian mud-nesters (Grallinidae, Corcoracidae): immunological evidence. Australian J. Zool. 40: 173–179. Beresford, P., F.K. Barker, P.G. Ryan, and T.M. Crowe. 2005. African endemics span the tree of songbirds (Passeri): molecular systematics of several evolutionary 'enigmas'. Proc. R. Soc. B 272: 849–858. Clements, J.F. 1991. Birds of the World: A Checklist. 4th ed. Ibis Publ., Vista, CA. Coates, B.J., G.C.L. Dutson, and C.E. Filardi. 2006. Family Monarchidae (Monarchs), pp. 244–329 in Handbook of the Birds of the World (J. del Hoyo, A. Elliott, & D.A. Christie, eds.). Vol. 11. Lynx Edicions, Barcelona. Filardi, C. E., and C. E. Smith. 2005. Molecular phylogenetics of monarch flycatchers (genus Monarcha) with emphasis on Solomon Island endemics. Molec. Phylog. Evol. 37: 776–778. Jønsson, K.A., F. Pierre-Herni, R.E. Ricklefs, and J. Fjeldså. 2011. Major global radiation of corvoid birds originated in the proto-Papuan archipelago. Proc. Nat. Acad. Sci. 108: 2328-2333. Pratt, H. D., P. L. Bruner, and D. G. Berrett. 1987. A Field Guide to the Birds of Hawaii and the Tropical Pacific. Princeton Univ. Press, Princeton, N.J.
Rheindt, F.E. and R. Hutchinson. 2007. A photoshot odyssey through the confused avian taxonomy of Seram and Buru (southern Moluccas). Birding Asia 7: 18–38. Simpson, K, and N. Day. 1996. A Field Guide to the Birds of Australia, rev. 5th ed. Penguin Books Australia Ltd., Ringwood, Victoria, Australia.